Tag Archive | "Goji Berries"
FMIF Holdings, LLC is recalling Snow Monkey Goji Berry and Cacao 8oz. pods because it has the potential to be contaminated with Listeria monocytogenes, an organism that can cause serious and sometimes fatal infections in young children, frail or elderly people, and others with weakened immune systems. Although healthy individuals may suffer only short-term symptoms such as high fever, severe headache, stiffness, nausea, abdominal pain and diarrhea, Listeria infection can cause miscarriages and stillbirths among pregnant women. 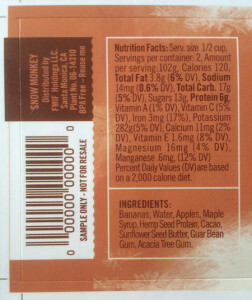 To date, no illnesses have been reported from consuming Snow Monkey products. Products were distributed via online order between May and June 2016 in CA, MO, MA, NY, FL, IL, NV, AZ, TX, HI, OR, CO, D.C., MI, CT, ME, NJ, NH. None of these products were sold at retail locations. The products are packed in 8oz plastic pods with sticker labels. The Barcode reads ‘000000000000 Sample Only – Not for Resale.’ Barcode can be found printed horizontally on the side of the label next to the nutritional facts. “We were informed by the FDA that Listeria monocytogenes were found in the continuous freezer line at ‘Dr. Bob’s’ Ice Cream manufacturing plant,” said a company spokesperson. “‘Dr. Bob’s’ is our former manufacturing plant, and we have used their continuous line on one occasion to fill some of our 8oz pods. Customers that have received our 8oz pods via online order between May and June 2016 are urged to dispose of any remaining products immediately as they may be at risk. “The majority of our 8oz pods were filled with a batch machine, there was no Listeria found in the batch machine by the FDA. All other 8oz units sold in retail stores or online, outside of the May-June 2016 time frame, are not at risk of contamination. “Listeria monocytogenes thrives mostly in unpasteurized dairy or raw foods. Although our product is dairy free and none of our ingredients are raw, the FDA believes there is a chance the bacteria could be present in our product because it was found inside ‘Dr. Bob’s’ processing equipment. Five Ice Cream companies have issued voluntary recalls of their products as a result of this situation. Dr. Bob’s has recently closed their business. If you still have 8oz pods of Subzero Superfood in your freezer we highly recommend you do not consume it and throw it away. Please contact us with and questions or concerns through kingdom@snow-monkey.com or (951) 878-0887 during weekdays 9am-4pm PST. Black Lace elderberry can beautify the landscape and provide bumper crops of nutritious fruits. (NAPS) Superfruits—fruits that are exceptionally rich in vitamins and antioxidants—are popular ingredients in a variety of healthy foods. Fortunately, although “superfruit” connotes something rare and exotic, a surprising number of these plants, including aronia, elderberry and goji berry, are hardy shrubs that can be grown right in your backyard. They’re easy to grow and require no spraying or complicated pruning and produce pound after pound of juicy, nutritious fruit every year. Aronia is a large shrub native to eastern North America. With showy white flowers in spring and blazing red leaves in autumn, it makes an excellent choice for landscaping around your home. Large clusters of glossy black berries ripen in late summer, making aronia a standout in the kitchen as well as the garden. The fruits are sometimes known as chokeberries because of their very sour flavor but they can be sweetened and used in juice, jam, desserts, even wine, which makes it even easier to savor their high levels of antioxidants and vitamins. In fact, they’ve been enjoyed in Scandinavia, Eastern Europe, and Russia for decades. Aronia tolerates winter temperatures as low as -40° F, and does best when planted where it will get at least six hours of sun each day. 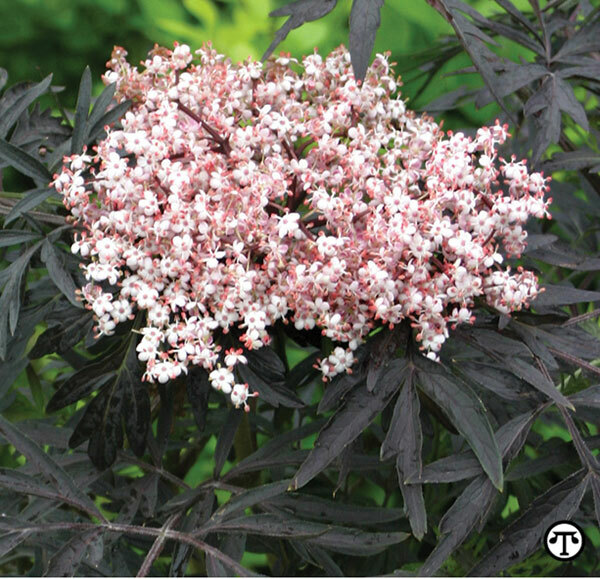 Elderberry is another North American native shrub that you can count on to beautify the landscape and provide bumper crops of nutritious fruits. Varieties that have been se-lected for ornamental foliage are especially useful for home gardeners, as they are even more attractive than plain green wild types. Black Lace, which was developed in England, where elderberry flowers and berries are eaten regularly, has delicate, lacy foliage in a dramatic near-black color. Black Beauty has bigger, bolder foliage but the same dark purple-black color. Both offer large pink flowers that give way to small black berries that are very high in vitamin C; research suggests they can be effective in minimizing flu symptoms. Elderberry plants don’t mind cold weather, surviving through temperatures of -25° F, and they can grow well even in partial shade (up to four hours a day). For the most abundant elderberry harvest, you should put at least two plants in your garden. Sweet Lifeberry goji produces antioxidant-packed berries of exceptional vigor, flavor and size. 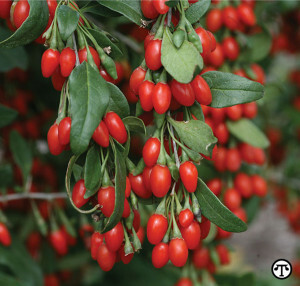 Goji berries are antioxidant-packed and sell for high prices at health food stores but they’re actually easy-to-grow shrubs. Also known as wolfberry, the rich purple flowers appear in early summer and are followed by gleaming red berries. The plants produce fruit continuously until autumn and never need spraying or special attention. Though goji has been popular in China for many centuries, specially selected varieties have only recently become available in North America. These include Sweet Lifeberry and Big Lifeberry goji from Proven Winners ColorChoice Shrubs, and they were chosen for their exceptional vigor, flavor and size. Goji berries can tolerate temperatures as low as -20° F. They need to be grown in a sunny spot but they’re not fussy about soil and need little water or fertilizer once they’re established. They can be planted in the ground or grown in a large pot on a deck or patio. You can find all these plants at a garden center, in the fruits or the shrubs section. They cost between $20 and $50 depending on size. For further facts, tips and re-cipes, visit www.ProvenWinners.com/VitaminBerries.